The Treasury secretary, Timothy F. Geithner, said on Tuesday that taxpayers were recovering their investment from the financial bailouts as the program was wound down. But he acknowledged there would probably be a loss from the rescue of the insurer American International Group. Mr. Geithner told a watchdog panel that banks had repaid about 75 percent of the bailout money they received, and the government’s investments in those banks had brought taxpayers $21 billion. Mr. Geithner also said at a hearing of the Congressional Oversight Panel that the auto industry had made significant structural changes, and that the chances that General Motors and Chrysler would repay their bailout money had improved. The oversight panel was created by Congress to oversee the Treasury Department’s $700 billion financial bailout program, created at the height of the financial crisis in the fall of 2008. The panel has been critical of the program, known as the Troubled Asset Relief Program, or TARP. 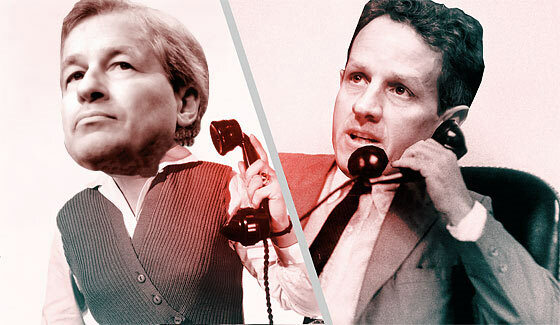 TARP “has helped restore financial stability at a much lower cost than anticipated,” Mr. Geithner said in his testimony. She criticized the department for not conducting additional stress tests of the financial system, as was done with the 19 biggest banks. Panel members also criticized the Obama administration’s flagship effort to help people in danger of losing their homes, which is falling flat, according to numbers released Monday. More than a third of the 1.24 million borrowers who have enrolled in the $75 billion mortgage modification program have dropped out. Richard Neiman, an oversight panel member who is New York’s top banking regulator, said many families that relied on the government’s program to keep their homes “may be left out in the cold.” He asked Mr. Geithner why thousands of mortgage modifications had been canceled. Mr. Geithner said the homeowners involved had been unable to prove income and therefore their eligibility for the program. Mr. Geithner said A.I.G. was making progress in restructuring its operations and divesting businesses so that taxpayers could recoup their investment. However, he added, the government’s investment “will likely still result in some loss.” The Congressional Budget Office has estimated that taxpayers will lose $36 billion. Much of the money needed to repay the government will come from the sale of assets. Hmmm so the US govt has got 75% of it's money back, but yet US govt debt hasn't reduced. Excellent slight of hand ie get the bank money back and then simply spend it as part of the federal budget because of the collapsing tax revenues? Gee Timmy, are you going to revisit this line of utter bullsh1t you ran on the American public? "With the recent announcements on repayments, we are now on track to reduce TARP bank investments by more than 75 percent, while earning a healthy profit on that commitment,"
PROFIT means that after expenses you have more money than you started with. Geithner estimated that TARP would end up costing taxpayers $105 billion. You lying sack of crap. I said at the time that this program would be a monstrous net loss for the taxpayer, and I was right - and you were wrong. $500 says that not one mainstream media source calls you on your horsecrap lie that TARP would "make a profit" for the American Taxpayer. Oh, and the banks? They paid out right near $100 billion in 2009 in salaries and bonuses. Guess where they got the money? Yep. They stole it from you, the taxpayer, by placing their MOLE, Geithner, in Treasury where he literally handed them YOUR MONEY. PS: That "estimate" almost certainly does not include GM's BS claim of "repaying" Treasury - with other bailout funds. If anything, this is a gross understatement of the losses taxpayers are being forced to absorb in order to protect the fraud and looting by the banks. Dennigers little rant against him. $1.5 trillion of mortage (and other crap) on the books? Incredible that anyone would fall for it. If the American people fall for it, than they deserve what they are gonna get. Sounds like the banks are about to ask for another bail-out. "No they haven't" says 10 year old with a calculator. I just got a call from a very important client, they say that the figures are wrong... basically I've checked all other possibilities and it's come down to the calculator. ... Well, I don't know, circuitry? Sorry, who is this that I'm talking to?